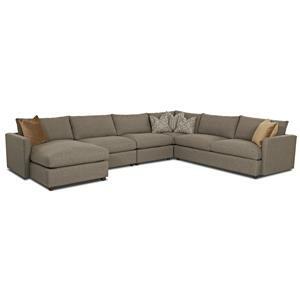 This sofa highlights casual style and accommodating design. 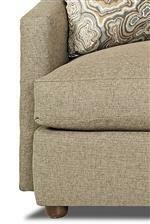 Featuring two down blend cushions with loose back pillows, the sofa provides exceptional comfort and support. Highlighted by track arms and barely exposed legs, this casual sofa presents a wonderful centerpiece for your living room. 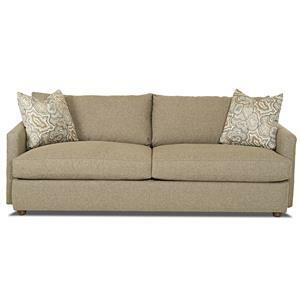 The Leisure Casual Sofa by Klaussner at Powell's Furniture and Mattress in the Fredericksburg, Richmond, Charlottesville, Virginia and Maryland area. Product availability may vary. Contact us for the most current availability on this product. Leg or Skirt Slightly exposed leg. Padding & Ergonomics Down blend seat cushions and loose back pillows. 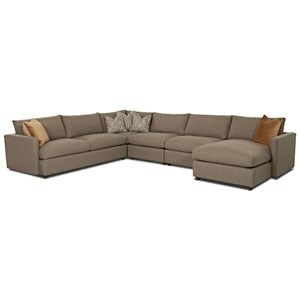 A beautiful addition to any living room, the Leisure collection showcases casually-styled furnishings. Highlighted by track arms and exposed legs, the pieces feature supportive down blend cushions and comforting loose back pillows. Featuring a variety of seating options, the Leisure collection allows you to mix and match to fit your living room needs. The Leisure collection is a great option if you are looking for Casual furniture in the Fredericksburg, Richmond, Charlottesville, Virginia and Maryland area. 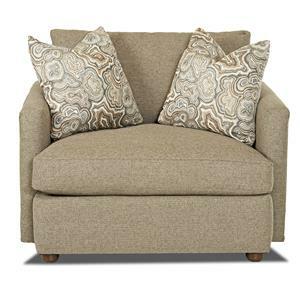 Browse other items in the Leisure collection from Powell's Furniture and Mattress in the Fredericksburg, Richmond, Charlottesville, Virginia and Maryland area.